Nutmeg is one of the most popular spices used worldwide. It is one of the highly priced spices known. From ancient times, nutmeg has been a natural remedy for various ailments. Some of the health benefits are listed below. • Nutmeg oil helps to improve concentration and increases circulation by stimulating the brain and hence reduces stress. • It stimulates blood circulation, and thereby has a positive effect on the cardiovascular system. • Nutmeg helps to detoxify liver and kidney. • It helps to relieve rheumatic pain, neuralgia and sciatica. • Nutmeg oil is effective in treating menstrual cramps, joint pain and muscular pain as it is an excellent sedative. • It is also effective in relieving cold and is often used in cough syrups. • Diarrhea caused by indigestion can be eased by a mixture of nutmeg and apple juice or banana. • Nutmeg has the properties to induce sleep. A mixture of nutmeg paste with honey can help reduce disturbed night sleep in babies. 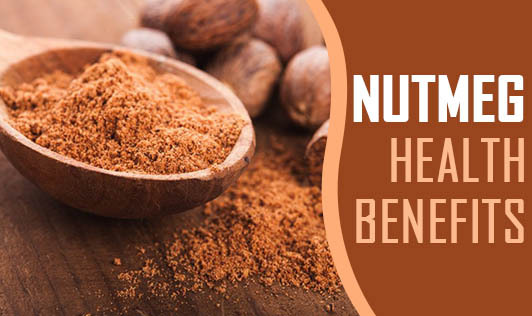 • As nutmeg has antiseptic properties, it is effective in reducing tooth aches and aching gums. • Nutmeg is one of the best choices to achieve smoother and healthier skin. Consumption of large doses i.e., 30g or more than 6 table spoons in a day, of nutmeg can be toxic, producing double vision, disorientation and convulsions. Serious side effects might include hallucinations and seizures. Consumption of nutmeg in higher doses by pregnant women might lead to miscarriages or birth defects. Incorporate nutmeg in sauces, soups and confectioneries to give a rich flavor and freshness to your recipes.